With the rise of IoT and technology in general, electronics are featured in myriad environments. This means that sensitive electronic connections are potentially exposed to hazards like extreme temperatures, moisture, and dust that can harm components and disrupt the integrity of the assembly itself. One preventative measure you can take is the use of PCB conformal coating during the production process. This procedure applies a thin transparent film to a circuit board, which contours to its shape and protects its components. 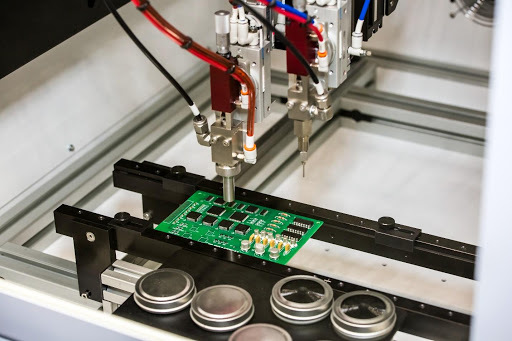 If your assembly will potentially face exposure to adverse conditions, you should consider whether conformal coating is right for your design. If so, consider which types of conformal coating make the most sense and with which method should you apply it. A simple application method, this is best for low-volume production, rework, and repair. Brush coating is done by hand and tends to be thicker and less cosmetically appealing. This option is best for those without the tools to utilize other options or when working on a few boards at a time. This method involves using an aerosol spray to apply the coating. Also better for lower-volume production, spraying can be time-consuming because all areas that don’t require coating need to be masked. This method provides a superior surface finish and is cost-effective, but doesn’t offer deep penetration of the board. “Dipping” involves submerging a board in coating solution, then withdrawing it. Good for high-volume production, this method is fast, accurate, and completely penetrates the board, coating the entirety of the assembly. However, masking must be perfect to avoid leakage, making many boards unsuitable due to design. Only boards that accept coating on both sides can be subject to this method. This strategy uses automated robotic spray nozzles to apply conformal coating to specific areas of the assembly. Another high-volume method, selective coating is fast and accurate and applies the coating directly to the areas of the board where it is required, eliminating the need for masking. You must design your circuit board to be compatible with selective coating.